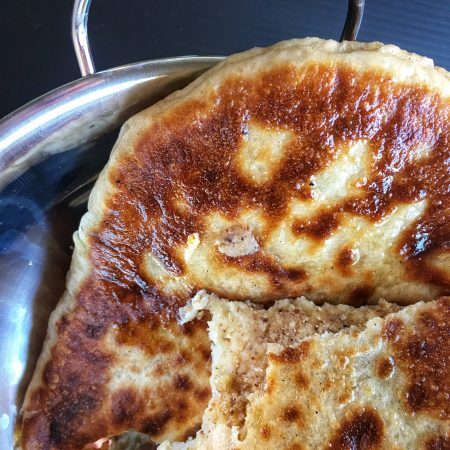 Vegan naan bread is deceptively simple to make, and I honestly think anyone, whatever their baking level, could make them. I’ve replaced the traditional ghee used in Indian cookery with a light olive oil and it works just as well. 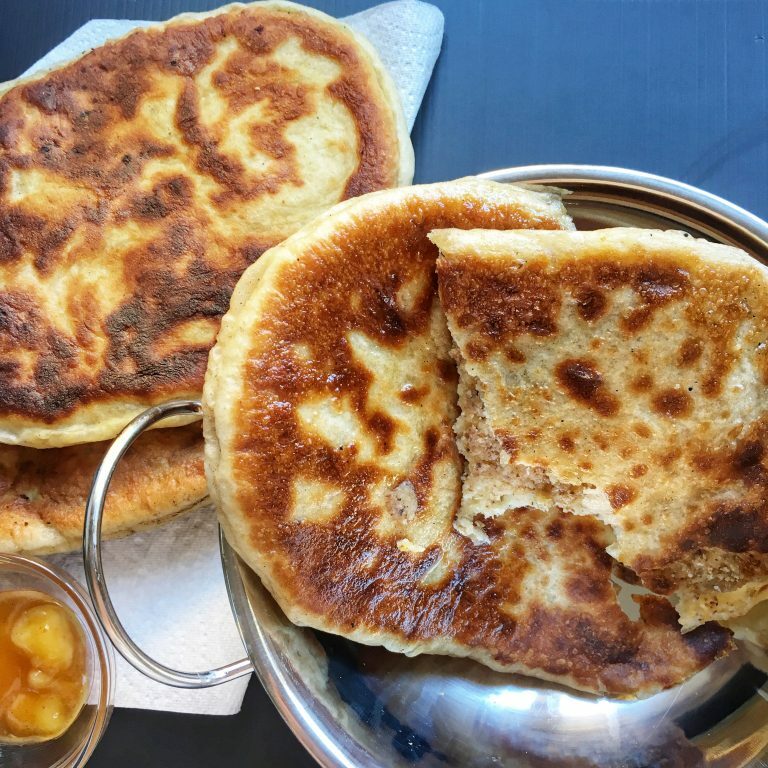 Peshwari is my naan of choice but you can keep it plain or use my alternate garlic naan bread recipe instead. Honestly, the almonds, coconut and dried fruit in a peshwari naan is so yummy I could happily just eat it as a dessert, but obviously it works well at mopping up delicious curry too. So what’s the secret to making naan at home? Nothing but a soft dough and a frying pan! If you don't like peshwari then keep it plain or use the alternate garlic naan recipe. Mix all your dry ingredients in a bowl. Make a well in the centre and pour the warm water in. Use a wooden spoon to get to a rough dough stage. You can now get your hands involved and mix to a smooth dough. Knead for around 10 minutes until you have a nice soft, smooth dough. The dough should now be doubled in size. Punch it back and give it a quick knead for a minute or two to get rid of any big air holes. Weigh your dough and divide into 6. 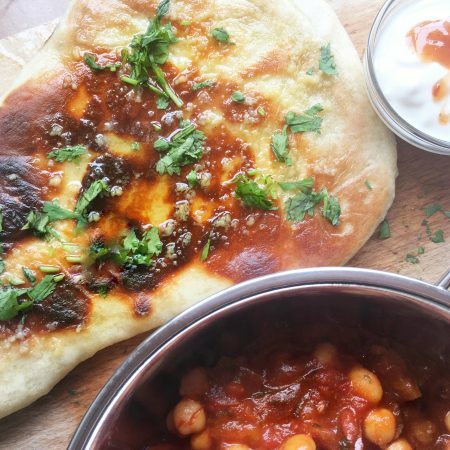 If making plain or garlic naan then move to the next step, if you're making peshwari naan then stick around! If you want to make life easy for yourself then put your filling ingredients into a Nutribullet or similar and whizz everything up for a few seconds. If you want to stay more authentic then just mix your ingredients together in a small bowl. Using your hands, roll your dough into 6 ball shapes and press each one down into a disk large enough to hold the filling--10-15cm in diameter. Put 1/6 of your filling in the centre of the dough disk and carefully pick up the edges and squish together in the middle making sure you've sealed the topping inside the dough. Turn over so the seal is underneath. Use a rolling pin to roll your dough to about 5mm thick or as near as you can. Sometimes it helps to go back to it once you've rolled the others out and then give it another roll. The dough needs to be quite thin but you should be able to handle it without it ripping. Remember, it will puff up when cooking. To be authentic you're looking at creating a teardrop shape. Heat a tablespoon of oil in a frying pan on a medium heat. It's important to not get it too hot as the outside will cook/burn and the dough in the middle won't be cooked. (Speaking from experience, it also smokes the house out :D) It should take around 5 minutes to cook, flipping halfway. If they bubble up too much then press down with a spatula or similar. If you want to make the garlic naan then mix together the oil and garlic while you're cooking the naan. Once each naan is ready spoon or brush over the oil and scatter over coriander leaves if using. If you don’t need all 6 vegan naan bread today then I’m pleased to tell you that they freeze super well, so there’s no food waste! Once cooled, put in a freezer bag and stash in the freezer until needed. Defrost at room temperatureand then warm them up by grilling them, scattering some drops of water over the top so they don’t dry out. They taste just as good as when fresh. I’ve only tried this with the plain and peshwari naan, if you want to do the same with the garlic naan then I’d recommend freezing the naan and topping separately. Are there any other fillings or toppings you can think of that are a naan classic? It’s such a lovely soft dough and easy to do that I’d love to do more variations in the future. Let me know. 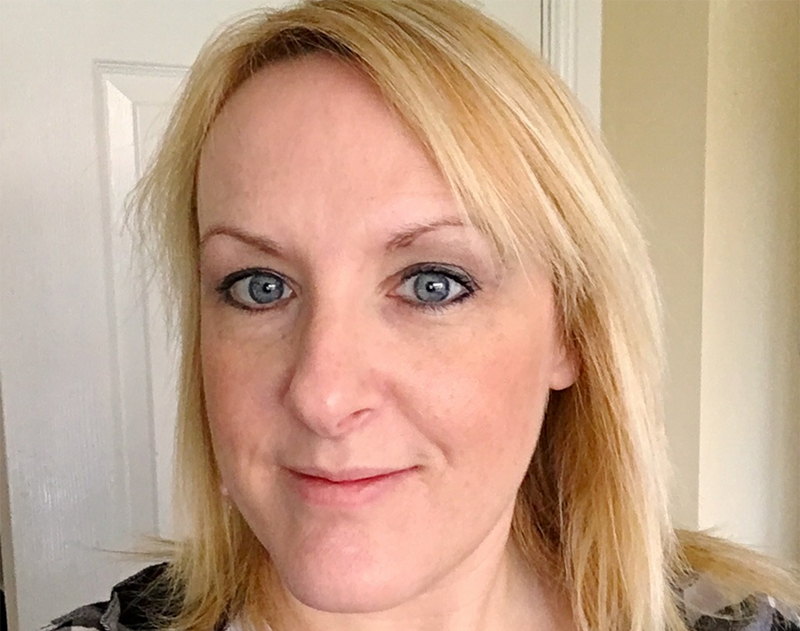 If you’re a social media fan then my favourite place is Instagram, and I’d love you pop by and say hello. I’m @veganbakeruk on Insta and on Twitter.